A fender (not to be mistaken for a bumper) is a padded or inflatable cushion, which stops a boat from bumping into another boat, or a mooring or a dock, or anything else. They work by absorbing shock on impact, which prevents the hull from being damaged. Here’s what else you should know. Cylindrical fender – these tend to have an ‘eye’ on both ends (or just one). It hangs down vertically, with a rope, which is secured by a bowline knot through one of the eyes (or if the fender is horizontal, a figure 8 stopper knot goes through both eyes). Centre rope cylindrical fender – this fender can hang down vertically or it can be positioned horizontally. It has a hole in the centre, which is threaded through with a rope. 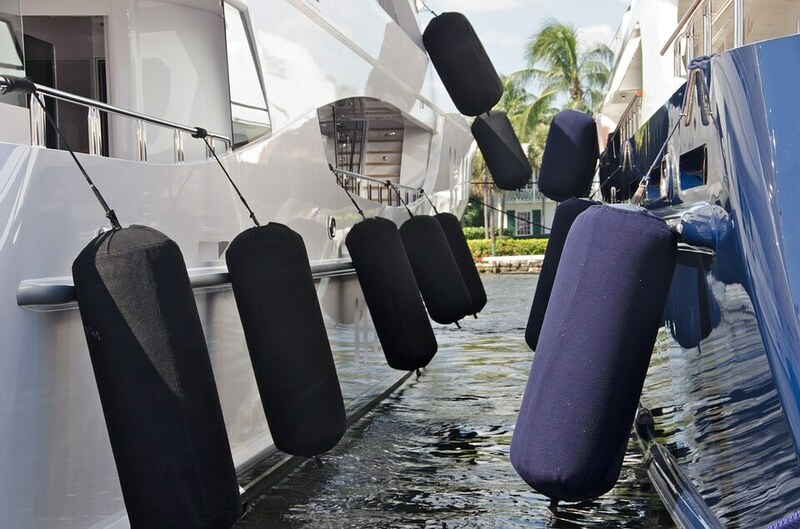 Flat fenders – are foam buffers (which means they’re not inflatable) typically used on smaller vessels. Simply secure the flat fender to the gunwales, and it will protect your boat from impact. What size fender do I need? Here are some tips for finding the right fender size for your boat. Forget buying a heap of small fenders, get the size right and have less – they’ll be more effective and easier to set up. As a general rule of thumb, for every 5 feet of a boat’s length you’ll need one fender an inch thick (in diameter). Small vessels may require just two fenders, while boats over 40-feet may need over 6. When inflated correctly (you can use a basic needle pump to do so), a fender should feel like a footy when it is squeezed. Do no attach the fender until rafting or docking. Why? Because the fenders may get stuck on other boats or pilings, which could cause the Captain to lose control. Make sure the crew is holding the line of the fender. Ask them to move the fenders around, when necessary. Once your boat has docked (or rafted), secure the fenders. Do this using a clove or slip hitch knot. Always hang your fenders at the lowest attachment spot, near the widest point of your beam. Only secure them to lifelines if a low spot, such as a cleat, is not handy. If you’re unsure how many fenders to hang, always hang them so your boat does not clash or rub bulkheads or hard pilings. If your vessel is going to be in one spot for a long time, make sure your fenders (and any extra rope) is not in the water. This will stop barnacles and algae from building up. Docking near a piling? Hang fenders in a horizontal position to stop them from rolling. Or, lay a fender board across a pair of cylindrical fenders then put that across the boat. If you’re hanging a cylindrical fender with a centre rope, use a half hitch or figure 8 knot on either side of it. That way the fender won’t slide out of it’s position. Always check the tidal range when you dock. This will prevent damage to the hull or lifeline stanchions, should the tide go out. Need cover, just in case? We’re here for you when the fenders don’t do their job. Contact us for a free quote on comprehensive marine cover that won’t break your budget. We can also review your existing marine insurance to ensure your adequately insured for the stuff that matters.